When I was a kid, I loved all things lemon flavored. Lemon Italian ices, lemon slushes, and lemonade. 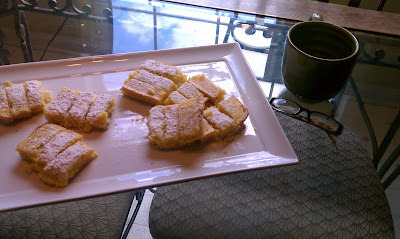 With one major exception up until today...lemon baked goods. I've never been a fan of anything that calls for a large amount of lemon juice baked right into it. The mere thought of it repulsed me, probably because I just couldn't understand why somebody would opt for a lemon cookie when they could have a chocolate chip cookie. 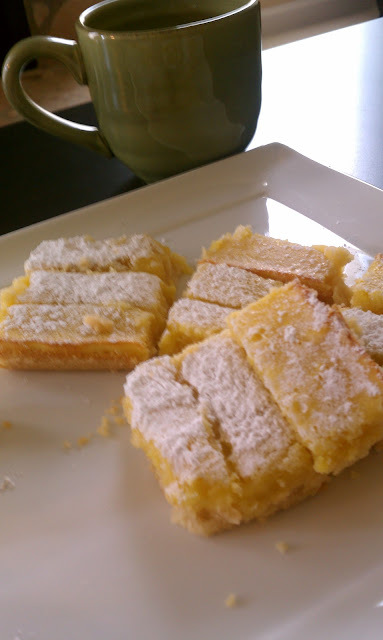 Or a lemon cake, when there was a perfectly good chocolate frosted one right next to it. I just didn't get the fascination with baked lemon desserts. Well, things change. I'm older and wiser now, and have been learning my way around the kitchen considerably. This includes making and baking foods I ordinarily wouldn't, simply because that's the only way to continue to grow and learn as a cook. Preheat the oven to 350 degrees. Cream together the butter and sugar in a large bowl using a mixer. In a separate bowl, whisk together the flour and sea salt. Add the flour mixture to the butter mixture and combine to make a dough. Roll the dough into a ball, and pat down into a 7x11 ungreased baking pan. Chill for 15 minutes in the fridge. After chilling, bake crust in the oven for 15-20 minutes, or until barely light browned. Set aside to cool. In a large bowl, whisk together the eggs, white sugar, lemon zest, flour, lemon juice, and orange juice. Whisk well, until there are no lumps. 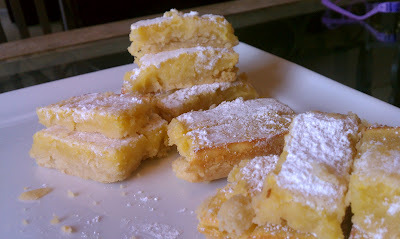 Pour the mixture over the cooled crust and bake in the oven for 20-25 minutes or until just set. 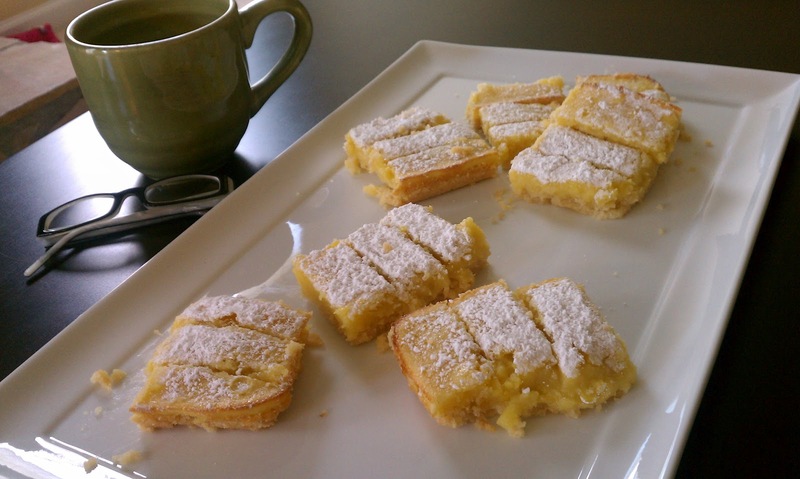 When lemon bars have cooled to room temperature, lightly dust with powdered sugar. Cut into large square or petite rectangles and serve with coffee or tea. Makes 8 large lemon bars or 24 petite rectangles.